My sister, Lynda, and I are Level III Certified Clinical Thermographers, certified and trained by the ACCT, American College of Clinical Thermology. We are grateful to be part of this wellness industry and strive to grow our individual businesses with integrity. We challenge ourselves to convey accurate and reliable information regarding what thermography can detect and how it is best utilized as a tool for monitoring breast health. Most clients understand its effectiveness as a tool for early detection of developing disease and preventive screening. 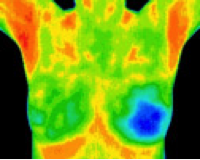 Although we feel we’ve covered this topic repeatedly, we’d like to review again the appropriate use of thermography in breast health. Thermography cannot (and is NOT designed) to "see" structures but rather, blood flow/temperatures related to the health of the breasts. It is in this fashion that thermography can detect the development of later biopsy-proven breast cancer potentially at a very early stage. At the appointment, we also discuss the requirement to establish a stable baseline to which all annual studies are compared against. Any changes in that stable baseline indicates the early development of disease and for those with a mindset of prevention, it's best to reverse this back to the previously-established, stable baseline. 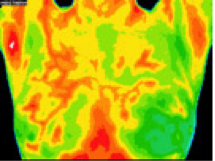 This is how thermography is best-utilized as a tool for PREVENTING future disease. Unhealthy lifestyle changes: poor diet, increased alcohol intake, decreased exercise & disturbed sleep. Follow-up Scan: Improvements to diet, sleep, reduced alcohol intake, stress management & nutritional supplementation. Back to stable baseline. If a tumor is not active (dormant) does that mean it's not significant and I won't need to do anything? Cancer is unpredictable and it wouldn't be practical to make such a far-reaching assumption. The truth is we don't know that it isn't significant. We encourage you to talk to a medical practitioner about what options there are regarding this finding. If a tumor is established, would this been seen in a mammogram? 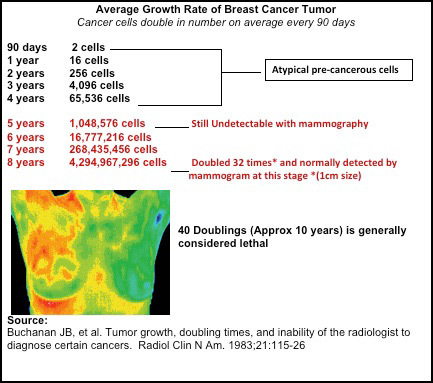 Older, more established tumors can be radiographically dense and therefore have a higher chance of being seen by a mammogram. However, there is no test that has 100% detection rate. On average, mammography will miss 1 in every 6 tumors. Understand that mammography's biggest limitation as an effective screening tool is breast density. As we age, breast density diminishes and the effectiveness of mammography would possibly increase. Although you may have had a negative mammogram several years ago, your breast density may have changed in such a way that what was difficult to see previously is now easier to visualize. This would likely increase the effectiveness of detection of tumors possibly not seen thermographically. Some prevention-minded doctors request that their patients have annual thermograms and to not allow more than 3-5 years between mammograms. Other medical doctors may still want to see a mammogram annually. Ultimately, it's your responsibility to look at all the data, talk to your doctor and decide what the best plan is for you. Breast thermography is NOT limited by breast density and while it does not replace any structural test, it offers the opportunity to detect changes at any stage of development (from the first year to when it is dense enough to be seen mammographically). See chart below. Earlier detection may lead to earlier diagnosis and possibly more treatment options. Ideally, it would be best to optimize breast health and prevent the advancement of disease.